In the past 5 years, I used Jimmie Holman's Poor Man's Rife Plasma Tube Driver Circuit in the High-Voltage Power Supply of my ELECTRO-CELLULAR ENERGIZER II™. 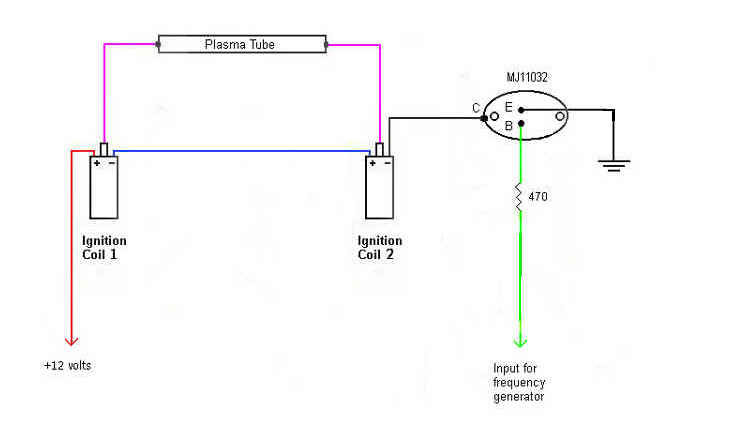 About 2 years ago, I was testing various Ignition Coils in pairs and connected 2 - 6 Volt Motorcycle Ignition Coils in a Series-Connected Circuit (see below) for the High Voltage Power Supply of my BIOENERAY XL2™ Plasma Tube Unit (version 1), which I called ELECTRO-CELLULAR ENERGIZER I™. 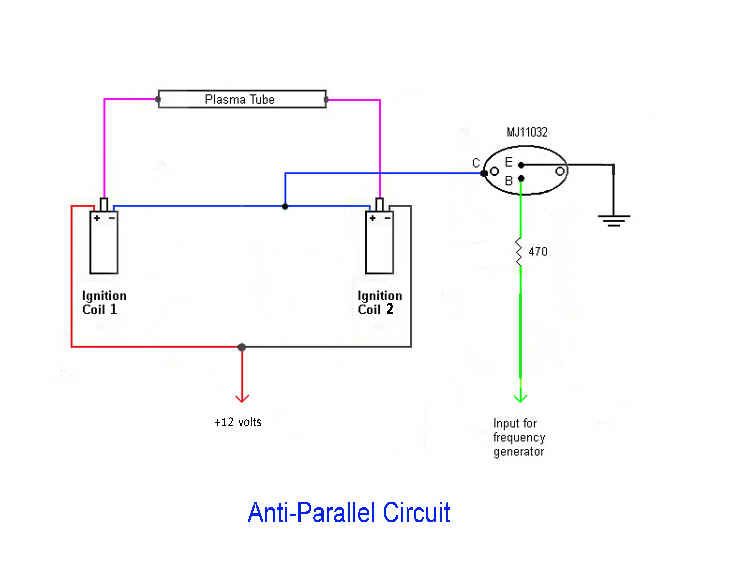 NOTE: The following Instructions can be used to connect 2 - Automotive or Motorcycle Ignition Coils in a UNIQUE Series-Connected (NOT Parallel or Anti-Parallel) Circuit. 1. Connect the Red/Positive (+) Wire, which is connected at the opposite end to your Battery/Power Supply, to the Positive (+) Terminal of your 1st Ignition Coil. 2. Connect one end of a 2"-3" length of Test Lead Wire to the Negative (-) Terminal of your 1st Ignition Coil. 3. Connect the opposite end of this Test Lead Wire to the Positive Terminal (+) of your 2nd Ignition Coil. 4. Connect the Black/Negative (-) Wire, which is connected at the opposite end to the Collector of your Power Transistor, to the Negative (-) Terminal of your 2nd Ignition Coil. 5. Connect one end of a 2-3" length of 7mm Automotive Ignition Wire (Magnecor CCS7) to the High Voltage Terminal of your 1st Ignition Coil. 6. Connect the opposite end of this 7mm Automotive Ignition Wire (Magnecor CCS7) to the Rear Terminal of a Red/Positive (+) Heavy Duty Banana Jack. 7. Connect one end of a 2-3" length of 7mm Automotive Ignition Wire (Magnecor CCS7) to the High Voltage Terminal of your 2nd Ignition Coil. 8. Connect the opposite end of this 7mm Automotive Ignition Wire (Magnecor CCS7) to the Rear Terminal of a Black/Negative (-) Heavy Duty Banana Jack. 9. Push the 7mm Red/Positive (+) Banana Plug (Mouser 174-5795), which is connected to a 3' length of 7mm Automotive Ignition Wire (Magnecor CCS7), and is connected to your Plasma Tube at the opposite end, into the Red/Positive (+) Heavy Duty Banana Jack. 10. Push the 7mm Black/Negative (-) Banana Plug (Mouser 174-5791), which is connected to a 3' length of 7mm Automotive Ignition Wire (Magnecor CCS7) and is connected to your Plasma Tube at the opposite end, into the Black/Negative (-) Heavy Duty Banana Jack. 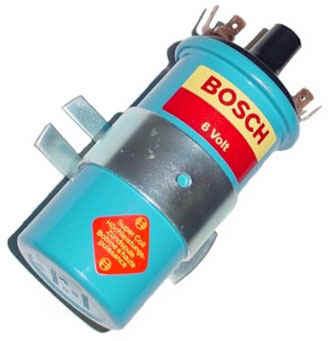 NOTE: I use 2 - BOSCH "Blue" 6 Volt Automotive Ignition Coils in my ELECTRO-CELLULAR ENERGIZER II™. If you do test your own Version of this UNIQUE Series-Connected Dual Ignition Coil Circuit, then please email and/or call me (614/237-2590 - Tom), and then let me know the Ignition Coils, that you've used, the E-Field Output, that you've observed and the HEALING Results, that you may have obtained.